Herfehdoost, G., Kamali, M., Javadi, H., Zolfagary, D., Emamgoli, A., Choopani, A., Ghasemi, B., Hossaini, S. (2014). Rapid Detection of Vibrio Cholerae by Polymerase Chain Reaction based on Nanotechnology Method. Journal of Applied Biotechnology Reports, 1(2), 59-62. Gholam Reza Herfehdoost; Mahdi Kamali; Hamid Reza Javadi; Davood Zolfagary; Asghar Emamgoli; Ali Choopani; Bahareh Ghasemi; Saeideh Hossaini. "Rapid Detection of Vibrio Cholerae by Polymerase Chain Reaction based on Nanotechnology Method". 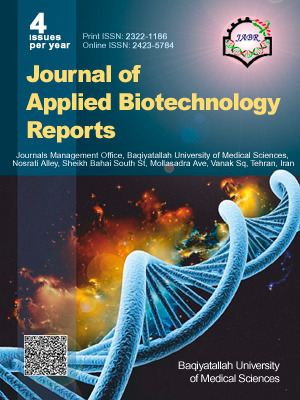 Journal of Applied Biotechnology Reports, 1, 2, 2014, 59-62. Herfehdoost, G., Kamali, M., Javadi, H., Zolfagary, D., Emamgoli, A., Choopani, A., Ghasemi, B., Hossaini, S. (2014). 'Rapid Detection of Vibrio Cholerae by Polymerase Chain Reaction based on Nanotechnology Method', Journal of Applied Biotechnology Reports, 1(2), pp. 59-62. Herfehdoost, G., Kamali, M., Javadi, H., Zolfagary, D., Emamgoli, A., Choopani, A., Ghasemi, B., Hossaini, S. Rapid Detection of Vibrio Cholerae by Polymerase Chain Reaction based on Nanotechnology Method. Journal of Applied Biotechnology Reports, 2014; 1(2): 59-62. Quick identification of Vibrio Cholerae in epidemics is important, on the other hand; conventional methods are time-consuming and costly. The aim of this study was to develop a rapid, inexpensive and high sensitivity method for quick identification of Vibrio Cholerae. For this purpose we designed a PCR detection based on magnetic nanoparticles for identification of bacterial DNA by PCR Dynabead. So we used the biotinylated Probe for binding to DNA extracted from Vibrio Choleraeand other bacterial species (Salmonella, Shigella, Pseudomonas, E.coli) Using magnetic bead isolated with magnetic field, the Vibrio genome-specific primers (HlyA) for pathogen detection (PCR) was used. The results showed specific band was just for Vibrio Cholera (PCR positive); therefore designed probe was specific for Vibrio Cholerae. According to the findings, this study is characterized the high sensitivity of PCR using biotin-containing probes for DNA of Vibrio Cholera in contrast to the traditional methods. Adibfar, p., new classification of vibrios group 1 heiberg. Acta Med Iranica, 1982, Vol. 24, pp. 43-49. Organization, W.H.O, Guidelines for drinking-water quality: recommendations. World Health Organization, 2004, Vol. 1. Tracz, D.M., et al., Rapid detection of Vibrio species using liquid microsphere arrays and real-time PCR targeting the ftsZ locus. J Med Microbiol, 2007, Vol. 56(1), pp. 56-65. Seas, C., Gotuzzo, E., Cholera: overview of epidemiologic, therapeutic, and preventive issues learned from recent epidemics. Int J Infect Dis, 1996, Vol. 1(1), pp. 37-46. Lipp, E.K., Rivera, N.G., Colwell, R., Direct detection of Vibrio cholerae and ctxA in Peruvian coastal water and plankton by PCR. Appl Environ Microbiol, 2003, Vol. 69(6), pp. 3676-3680. Singh, D.V., Matte, M.H., Matte, G.R., Jiang, S., Sabeena, F., Shukla, B.N., and et al., Molecular Analysis of Vibrio cholerae O1, O139, non-O1, and non-O139 Strains: Clonal Relationships between Clinical and Environmental Isolates. Appl Environ Microbiol, 2001, Vol. 67(2), pp. 910-921. Heidelberg, J.F., Eisen, J.A., Nelson, W.C., Clayton, R.A., Gwinn, M.L., Dodson, R.J., DNA sequence of both chromosomes of the cholera pathogen Vibrio cholerae. Nature, 2000, Vol. 406, pp. 477-483. Olsvik, O., Wahlberg, J., Petterson, B., Uhlén, M., Popovic, T., Wachsmuth, I.K., Fields, P.I., Use of automated sequencing of polymerase chain reaction-generated amplicons to identify three types of cholera toxin subunit B in Vibrio cholerae O1 strains. J Clin Microbiol, 1993, Vol. 31(1), pp. 22-25. Faruque, S.M., Naser, I.B., Islam, M.J., Faruque, A.S., Ghosh, A.N., Nair, G.B., Sack, D.A., Mekalanos, J.J., Seasonal epidemics of cholera inversely correlate with the prevalence of environmental cholera phages. Proc Natl Acad Sci U S A, 2005, Vol. 102(5), pp. 1702-1707. Wilson, B.A., Salyers, A.A., Whitt, D.D., Winkler, M.E., Bacterial pathogenesis: A molecular approach. American Society for Microbiology (ASM), 2011. Low, K.F., Karimah, A., Yean, C.Y., A thermostabilized magnetogenosensing assay for DNA sequence-specific detection and quantification of Vibrio cholerae. Biosens Bioelectron, 2013, Vol. 47, pp. 38-44. Bauer, A., Rørvik, L., A novel multiplex PCR for the identification of Vibrio parahaemolyticus, Vibrio cholerae and Vibrio vulnificus. Lett Appl Microbiol, 2007, Vol. 45(4), pp. 371-375. Wang, D., Xu, X., Deng, X., Chen, C., Li, B., Tan, H., Detection of Vibrio cholerae O1 and O139 in environmental water samples by an immunofluorescent-aggregation assay. Appl Environ Microbiol, 2010, Vol. 76(16), pp. 5520-5525. Muir, P., Nicholson, F., Jhetam, M., Neogi, S., Banatvala, J., Rapid diagnosis of enterovirus infection by magnetic bead extraction and polymerase chain reaction detection of enterovirus RNA in clinical specimens. J Clin Microbiol, 1993, Vol. 31(1), pp. 31-38. Amagliani, G., Omiccioli, E., Campo, A., Bruce, I.J., Brandi, G., Magnani, M., Development of a magnetic capture hybridization‐PCR assay for Listeria monocytogenes direct detection in milk samples. J Appl Microbiol, 2006, Vol. 100(2), pp. 375-383. Thompson, D.E., Rajal, V.B., De Batz, S., Wuertz, S., Detection of Salmonella spp. in water using magnetic capture hybridization combined with PCR or real-time PCR. J water health, 2006. Vol. 4, p. 67-75. Mukerjee, S., Chapter V Principles and Practice of Typing Vibrio cholerae. Meth Microbiol, 1978, Vol. 12, pp. 115-151.